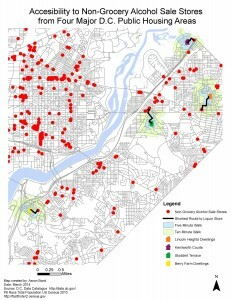 An Analysis of Food Accessibility in Public Housing Areas of South East Washington D.C. Very few of the prior studies on Public Housing in the U.S. have looked at the accessibility to healthy foods for the residents living there. Even fewer studies have focused on the fact that public housing is often located in food deserts. 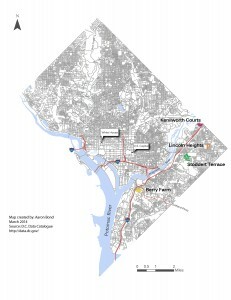 In this study I applied mapping and spatial analysis techniques to explore food accessibility from four of the major public housing areas in South East Washington D.C: Berry Farm Dwellings, Stoddert Terrace, Kenilworth Courts, and Lincoln Heights Dwellings (Map 1). Housing strongly determines people’s access to food, health care, recreation, etc. that, in turn, affect their quality of life. Urban low-income populations, such as those in the four public housing areas addressed in this study, often live in food desserts where they lack access to healthy and sufficient food options that are more bountiful in higher-income neighborhoods. Food insecurity and lack of food access exacerbate the health and wealth disparities in cities. Using GIS data from D.C.’s Data Catalogue, I looked at the proximity of D.C. public housing areas to their closest grocery stores. 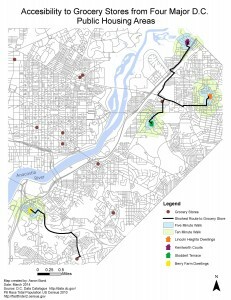 Mapping walkable networks and using Network Analyst of ESRI ArcGIS, I determined how long it would take a resident of each of the four public housing areas to walk to the nearest full-service grocery store and compared this distance with the residents’ walk to the nearest non-grocery alcohol sales store. The results of my analysis shed light on the food access of public housing residents in South East Washington D.C. and can be useful to the planning of food security initiatives for the area. 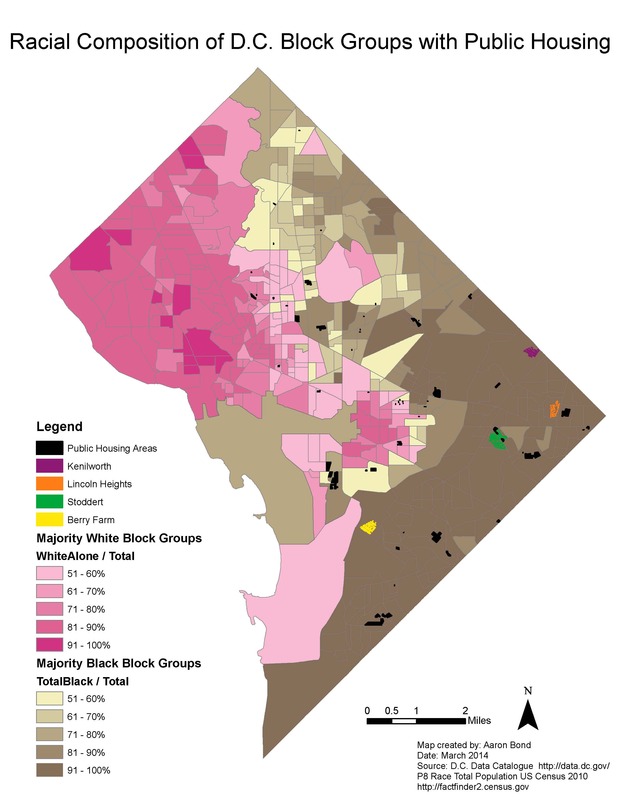 As shown in Map 2, the majority of public housing in Washington D.C is located in majority black block groups in the South East. Each of the public housing areas that I looked at fall within block groups that are over 91% black. This means that the public housing area’s access to food is generally shared by a large segment of the black population in D.C. Map 3 shows that none of the full-service grocery stores included in the D.C.’s Data Catalogue fall within either the five or ten minute walkable networks around each of the four public housing areas. 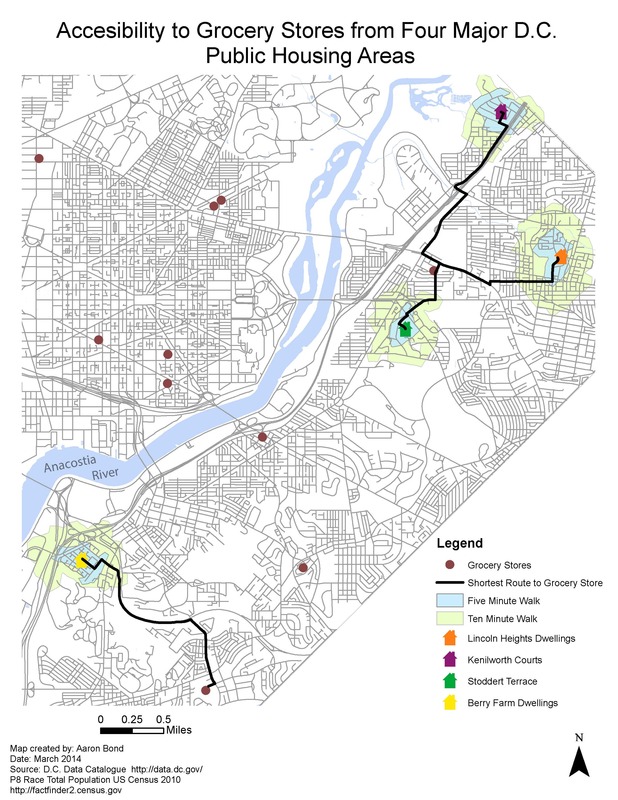 Stoddert Terrace has the least walking distance to its nearest grocery store at 13 minutes, while it takes Berry Farm residents a whole 37 minutes to walk to their nearest grocery store. While there were no grocery stores within a ten minute walk of any of the public housing areas, each public housing area had a non-grocery alcohol sales store within a ten minute walk. 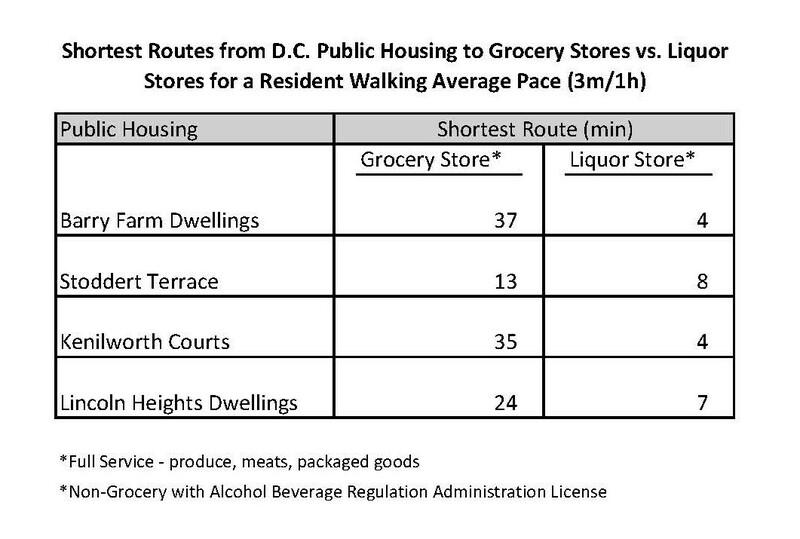 The table below compares the shortest routes from each public housing area to the nearest grocery store with the shortest routes to non-grocery alcohol sale stores. 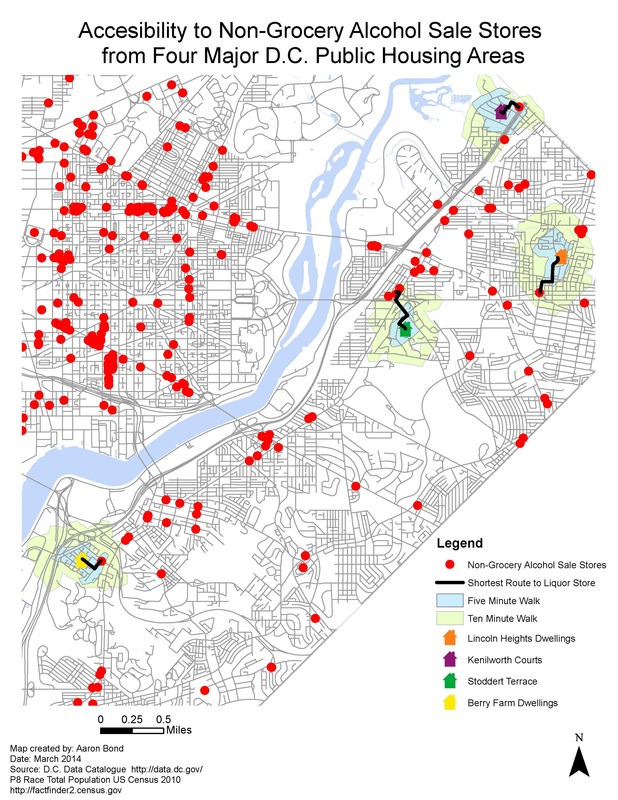 Map 4 demonstrates that non-grocery alcohol sale stores are more accessible to public housing residents and far more abundant than grocery stores in South East D.C. For instance, residents at Kenilworth Courts have only a 4.5 minute walk to their nearest non-grocery alcohol sales store compared to their 35 minute walk to the nearest grocery store. The lack of stores selling fresh produce and meat along with the plethora of those exclusively selling alcohol and packaged food have far-reaching implications for the health of the majority of D.C. public housing residents. My analysis points to reasons why low-income areas in D.C. may suffer from higher food-insecurity and obesity than other areas. Due to convenience, residents of public housing units in Southeast D.C. may shop more at non-grocery alcohol license stores, such as small convenient stores, gas station food marts, or liquor stores that lack healthy, nutrient-rich foods found at full-service grocery stores. 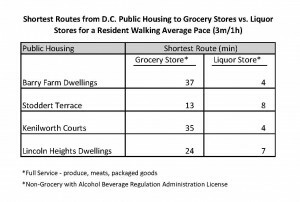 More research is needed to show whether the convenience of these alcohol sale stores versus grocery stores incites higher levels of alcoholism in D.C.’s South East public housing. By mapping and analyzing networks related to D.C. public housing and their surrounding amenities, we can create awareness and develop powerful insight that can strengthen community development initiatives impacting low-income and black neighborhoods in D.C.
Disclaimer: This study was conducted as part of a course requirement for UP 418 (GIS for Planners) at the University of Illinois at Urbana-Champaign. As a class project it may lack analytic rigor, data accuracy, and validity. Findings of this study can only be shared, disseminated, or reproduced after getting consent from the student and the instructor.